Background: Microorganisms growing in a biofilm are associated with chronic, recurrent infections, and health problems for patients with indwelling devices which are difficult to treat with antimicrobial agents. Staphylococcus species are the most common microorganisms isolated from these patients. This study was conducted to detect biofilm production in Staphylococcal isolates from orthopedic device-related infections (ODRI) and chronic osteomyelitis (CO) and correlation of antimicrobial susceptibility pattern between biofilm producers and nonbiofilm producers. Materials and Methods: A cross-sectional study was carried out at the Department of Microbiology in a tertiary care center after the Institutional Ethics Committee approval, from October 2014 to September 2016. Detection of biofilm was performed by Congo Red Agar (CRA), tube method (TM), and tissue culture plate (TCP) methods. Antimicrobial susceptibility test was performed by Kirby–Bauer disk diffusion method, and minimum inhibitory concentration for oxacillin and vancomycin was determined according to the Clinical Laboratory Standard Institute guidelines. Results: A total of 51 clinical isolates, consisting of 45 Staphylococcus aureus and 6 coagulase-negative Staphylococci (CoNS), were isolated from 47 CO and 4 ODRI patients of which 32 were methicillin-resistant S. aureus and 2 MRCONS. Biofilm production was detected in 22 isolates by TCP, 18 by TM, and 13 by CRA methods. Fifty percent ODRI isolates and 42.5% CO isolates were biofilm producers. The biofilm producers have lower antimicrobial sensitivity pattern in all except vancomycin. Conclusion: Biofilm producers were detected from 43.1% of total isolates with higher antimicrobial resistance pattern. Unequivocal direct observations have established that bacteria that cause chronic infections and other device-related infections grow in matrix-enclosed biofilms. Bacteria escape host defenses by adhering tightly to the damaged bone and coat themselves with a protective polysaccharide-rich biofilm., This study was undertaken to isolate Staphylococcus species and detect their biofilm production and correlate the antimicrobial susceptibility pattern between the biofilm producers and the nonproducers at a tertiary care center in north eastern India. A cross-sectional study was conducted on patients diagnosed with CO and ODRI of which 76 nonrepeated clinical samples were collected which consist of aspirates and intraoperative pus/material in a sterile syringe or with a sterile swab and were processed at microbiology department in a tertiary care center in north eastern India from October 2014 to September 2016. The study was carried out after obtaining approval from the Institutional Ethics Committee. Processing of clinical samples was done according to standard operative procedures. Presumptive identification of Staphylococcus species was done from the routine isolates based on the colony growth character, Gram staining, and catalase reactions. Staphylococcus aureus and coagulase-negative staphylococci (CoNS) were differentiated by coagulase test and colony characters in blood agar and mannitol salt agar. Antimicrobial susceptibility testing of isolates was done in Mueller–Hinton agar by Kirby–Bauers disk diffusion method according to the Clinical Laboratory Standard Institute (CLSI) guidelines. Minimum inhibitory concentration (MIC) for oxacillin and vancomycin was determined by Epsilometer test according to the CLSI guidelines. The presence of biofilm production was detected by Congo Red Agar (CRA), Christensen's tube method (TM), and tissue culture plate (TCP) methods. TCP Method: TCP assay was done as described by Christensen et al. Plates were dried and the optical density (OD) was determined with micro enzyme-linked immunosorbent assay auto reader at the wavelength of 620 nm. The values were interpreted based on their OD values. The cutoff value OD was calculated as 3× (times) standard deviation above the mean OD of ten blank tissue culture plate wells stained by the above-described procedure. The cutoff value was 0.091 OD. Interpretation of biofilm production was done as nonbiofilm producers (nonadherent) – OD value is less than the cutoff value, i.e., 0.091; weak biofilm producers (weakly adherent) – OD value is >0.091 but ≤0.182; and strong biofilm producers (strongly adherent) – OD value is 2× cutoff value, i.e., >0.182. Quality control was maintained in all the steps and the tests were also carried out with control strains. Mathur et al. showed in their study that the addition of sugar helps in biofilm formation so TCP and TM methods were performed by the addition of 1% glucose on Trypticase soy broth. Statistical analysis was done with Statistical Package for the Social Sciences (SPSS) version 21.0 (SPSS, Chicago, IL, USA), and P < 0.05 was considered statistically significant. Out of the 73 clinical samples processed, 61 (83.5%) were culture positive and 12 (16.5%) were culture negative. Out of 61 culture positive isolates, 51 (83.6%) isolates were of Staphylococcus species of which 45 were S. aureus and 6 were CoNS. 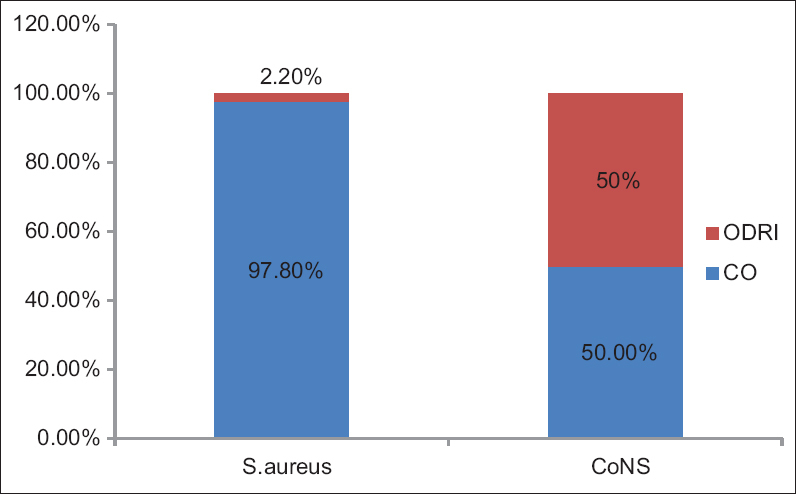 Among the 45 S. aureus, 44 (97.8%) were from CO and 1 (2.2%) from ODRI patients. 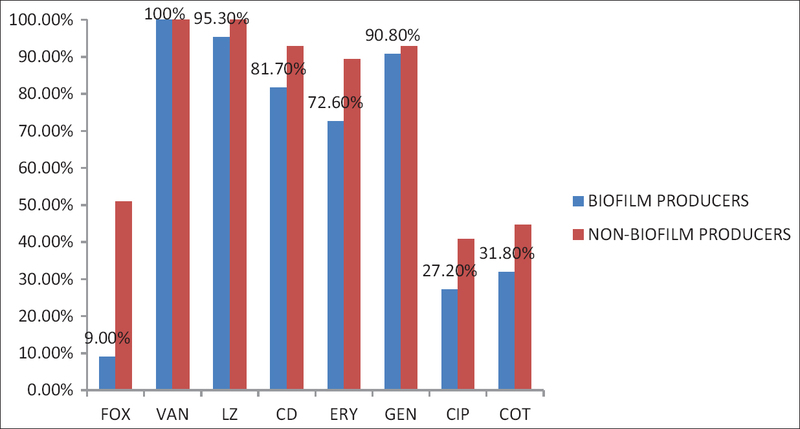 Out of 6 CoNS isolates, 3 (50%) were from CO and 3 (50%) from ODRI patients [Figure 1]. Out of the total 45 S. aureus, 13 (28.9%) were methicillin-sensitive S. aureus (MSSA) and 32 (71.1%) were methicillin-resistant S. aureus (MRSA). From the total 6 CoNS, 4 (66.7%) were methicillin-sensitive CoNS (MSCoNS) and 2 (33.3%) were methicillin-resistant CoNS (MRCoNS). Using the MIC, of the total 45 Staphylococcus aureus, 13 (28.9%) were MSSA with MIC <4 μg/mL and 32 (71.1%) were MRSA with MIC >4 μg/mL. Out of the total 6 CoNS, 4 (66.7%) were MSCoNS with MIC <0.25 μg/mL and 2 (33.3%) were RCoNS with MIC >0.5 μg/mL. 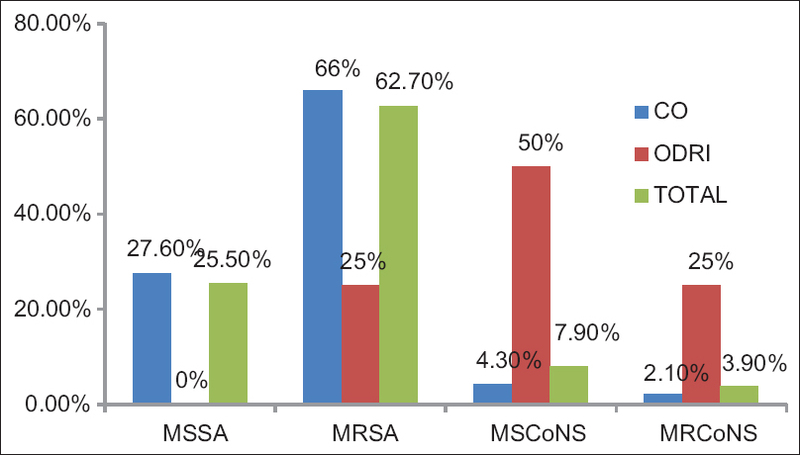 Therefore, out of the 47 CO isolates, 13 (27.6%) were MSSA, 31 (66%) were MRSA, 2 (4.3%) MSCoNS, and 1 (2.1%) was MRCoNS. From 4 ODRI isolates, 1 (25%) was MRSA, 2 (50%) MSCoNS, 1 (25%) MRCoNS, and no MSSA isolate [Figure 2]. MIC of vancomycin showed all isolates were <4 μg/mL. With CRA, 11 (21.6%) isolates were strong biofilm producers, 2 (3.9%) isolates were weak biofilm producers, and 38 (74.5%) isolates were nonbiofilm producers. In TM, 14 (27.5%) isolates were strong biofilm producers, 4 (7.8%) weak biofilm producers, and 33 (64.7%) were nonbiofilm producers. In TCP method, 17 (33.3%) isolates were strong biofilm producers, 5 (9.8%) were weak biofilm producers, and 29 (56.9%) were nonbiofilm producers [Figure 3]. Using TCP, out of 47 isolates from CO, 15 (31.9%), 5 (10.6%), and 27 (57.5%) were strong biofilm producers, weak biofilm producers, and nonproducers, respectively. 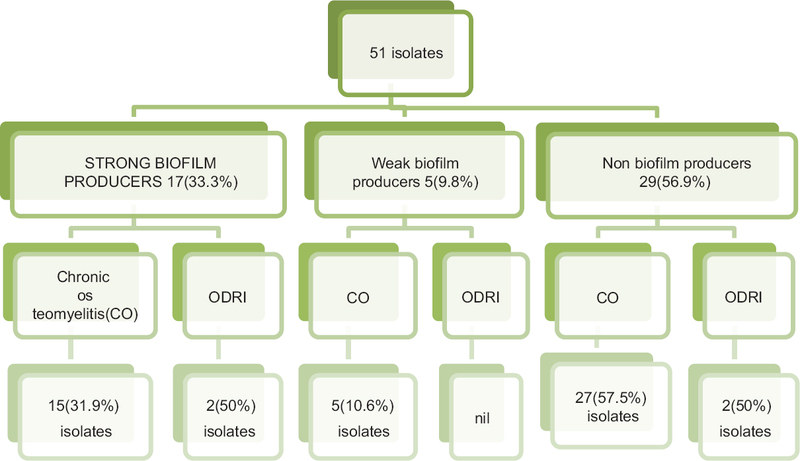 From the 4 isolates of ODRI, 2 (50%) and 2 (50%) were strong biofilm producers and nonproducers, respectively [Figure 4]. Antimicrobial sensitivity patterns of biofilm producers were linezolid 95.3%, gentamicin 90.8%, clindamycin 81.7% and erythromycin 72.6%, co-trimoxazole 31.8%, ciprofloxacin 27.2%, and cefoxitin 9%, whereas that of nonbiofilm producers were linezolid 100%, clindamycin and gentamicin 92.8%, erythromycin 89.4%, cefoxitin 51%, cotrimoxazole 44.7%, and ciprofloxacin 41%. The cefoxitin sensitivity was 9% for biofilm producers when compared to the 51% for nonbiofilm producers (P = 0.001) [Figure 5]. Out of the 51 Staphylococcus species, 47 (92.2%) were from CO and 4 (7.8%) were from ODRI. The drastic decrease of ODRI cases was due to better patient care and administration of prophylactic antimicrobials at the time of admission. Of the 51 isolates, TCP gave the highest number of biofilm producers detection (22 [43.1%]), followed by TM (18 [35.3%]) and CRA (13 [25.5%]). On comparing the three detection methods, namely, CRA, TM, and TCP, 10 isolates (2 ODRI and 8 CO isolates) were all detected by the three methods. Even though CRA was considered to be rapid and colonies remain viable on the medium, it is considered imprecise in the identification of biofilm producers. Knobloch et al. did not recommend CRA method for the detection of biofilm in their study. When TM and TCP were compared, 17 isolates were detected by both the tests which gave a stronger correlation than CRA as also stated by Růzicka et al. Similar to the study by Thakkar et al., TCP is considered as the gold standard by Mathur et al. 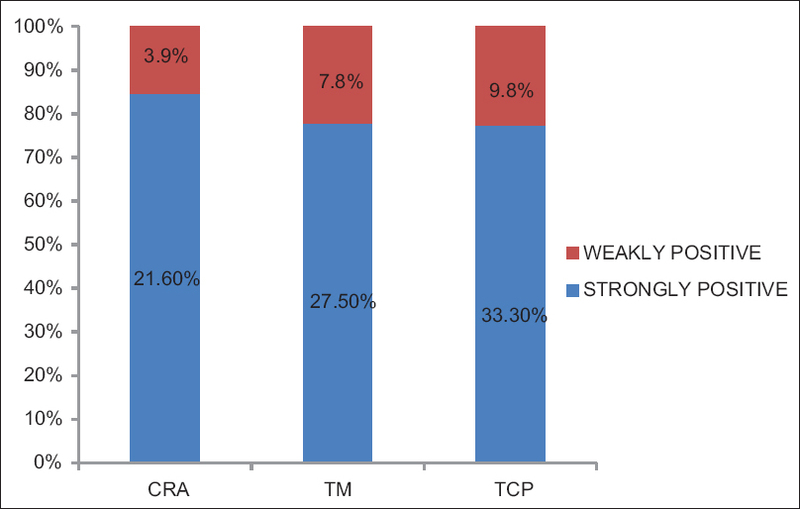 Using TCP as the gold standard, the sensitivity and specificity of CRA were found to be 6.8% and 90.2%, respectively, by Mathur et al., whereas they were found to be 11% and 92%, respectively, by Hassan et al. In this study, CRA was found to be 45.5% and 89.7%, respectively, which is attributed to the fact that color changes which comes at the latter part of incubation period are noted as well. The sensitivity of TM was found to be 77.3% and specificity 96.5% in this study, which is in agreement with previous similar study by Bose et al., with 76.3% and 97.5%, respectively. Out of the 22 (43.1%) biofilm producers detected in this study, 20 (42.5%) were isolated from CO and 2 (50%) were isolated from ODRI patients. This is similar to the number of biofilm producers detected by Thakkar et al., and Kawamura et al., where isolates from medical devices showed higher rates of biofilm formation. Although the formation of biofilm on indwelling medical devices is generally associated with CoNS, Staphyloccocus aureus strains were also capable of production of biofilm, where one MRSA was isolated from ODRI which was also described by Bose et al. In our study, of the 45 S. aureus isolated, 13 (28.9%) isolates were MSSA and 32 (71.1%) were MRSA. Out of 6 CoNS species, 4 (66.7%) isolates were MSCoNS and 2 (33.3%) MRCoNS. All the isolates were sensitive to vancomycin. In our findings, methicillin resistance was much higher compared to the study by Kumar et al., which may be due to the injudicious use of antibiotics. When the 17 (33.3%) strong biofilm producers were taken into account, out of 13 MSSA, 1 (7.7%) gave positive biofilm production. From 32 MRSA isolates, 14 (43.6%) isolates were strongly positive for biofilm. The 2 MRCoNS isolates were both strongly positive (100%) for biofilm, whereas none was positive from all the 4 MSCoNS isolated. Biofilm production was strongly associated with methicillin-resistant as compared to methicillin-sensitive strains which is similar to the finding by Thakkar et al. and Yadav et al. In our study, the cefoxitin sensitivity was 9% for biofilm producers when compared to the nonproducers (51%) indicating that most of the biofilm producers were methicillin resistant, which was statistically significant (P = 0.001). On comparison, the biofilm producers have lower antimicrobial sensitivity pattern in all except vancomycin, which was 100% sensitive. Linezolid, gentamicin clindamycin,erythromycin, cotrimoxazole, and ciprofloxacin all showed lower sensitivity pattern compared with the nonbiofilm producers which were all statistically insignificant. These findings were similar to that of Hassan et al., and Bose et al., where biofilm producing isolates were more resistant to antimicrobials as compared to the nonbiofilm producers. The increased resistance of biofilm producers to antibiotics may be because the biofilm bacteria exhibit a slow rate of metabolism and divide infrequently, resulting in decreased sensitivity to antibiotics targeted at the cell wall synthesis. The infections may initially respond only to relapse weeks or months later. Hence, invasive treatments, such as surgical removal and replacement of the infected tissue or device with long-term antibiotic treatment, are now the management of choices. So for proper treatment, screening for biofilm production is necessary and its detection should move from research to routine. The development of antibiofilm agents is the need of the hour. In the near future, silver nanoparticles may play a major role in the coating of medical devices and treatment of infections caused due to highly antibiotic-resistant biofilm. This was a hospital-based cross-sectional study at the Department of Microbiology, RIMS, Imphal, and therefore, it cannot represent the whole population of Manipur. Fifty percent ODRI isolates and 42.5% CO isolates were biofilm producers. The biofilm producers have lower antimicrobial sensitivity pattern in all except vancomycin with the nonproducers and most of the biofilm producers were methicillin resistant. Financial assistance received under “MD/MS Thesis Grant phase 7 and 8 (2014-2015)” from the Department of Biotechnology (DBT) Nodal Cell, Tezpur University vide Sanction order No. BT/Med/15/Vision-NER/2011, dated November 2, 2011 and Memo No. TU/DBT-NC/MD/MS-P7 and 8/14-15/15, dated August 27, 2015. Kumar V, Kumar A, Devi V. Evaluation of aerobic bacterial isolates and its drug susceptibility pattern in orthopaedic infections. J Med Sci Clin Res 2014;2:1254-60. Waldvogel FA, Medoff G, Swartz MN. Osteomyelitis: A review of clinical features, therapeutic considerations and unusual aspects. N Engl J Med 1970;282:198-206. Brady RA, Leid JG, Calhoun JH, Costerton JW, Shirtliff ME. Osteomyelitis and the role of biofilms in chronic infection. FEMS Immunol Med Microbiol 2008;52:13-22. Fernandes A, Dias M. The microbiological profiles of infected prosthetic implants with an emphasis on the organisms which form biofilms. J Clin Diagn Res 2013;7:219-23. Widmer AF. New developments in diagnosis and treatment of infection in orthopedic implants. Clin Infect Dis 2001;33 Suppl 2:S94-106. Costerton W, Veeh R, Shirtliff M, Pasmore M, Post C, Ehrlich G, et al. The application of biofilm science to the study and control of chronic bacterial infections. J Clin Invest 2003;112:1466-77. Høiby N, Bjarnsholt T, Givskov M, Molin S, Ciofu O. Antibiotic resistance of bacterial biofilms. Int J Antimicrob Agents 2010;35:322-32. Zimmerli W. Osteomyelitis. In: Kasper DL, Fauci AS, Hauser SL, Longo DL, Jameson JL, Loscalzo J, editors. Harrison's Principles of Internal Medicine. 19th ed. New York: McGraw-Hill; 2008. p. 838-45. Baird D. Staphylococcus: Cluster forming gram-positive cocci. In: Collee JG, Fraser AG, Marmion BP, Simmons A, editors. Mackie and McCartney Practical Medical Microbiology. 14th ed. United Kingdom: Churchill Livingstone; 2008. p. 67-71. Eliopoulos GM, Lewis JS, Bush K. Performance Standards for Antimicrobial Susceptibility Testing, M100S. 26th ed. Wayne, PA: CLSI; 2016. Freeman DJ, Falkiner FR, Keane CT. New method for detecting slime producing by coagulase-negative staphylococci. J Clin Pathol 1989;42:872-4. Mathur T, Singhal S, Khan S, Upadhyay DJ, Fatma T, Rattan A, et al. Detection of biofilm formation among the clinical isolates of staphylococci: An evaluation of three different screening methods. Indian J Med Microbiol 2006;24:25-9. Trampuz A, Widmer AF. Infections associated with orthopedic implants. Curr Opin Infect Dis 2006;19:349-56. Knobloch JK, Horstkotte MA, Rohde H, Mack D. Evaluation of different detection methods of biofilm formation in Staphylococcus aureus. Med Microbiol Immunol 2002;191:101-6. Růzicka F, Holá V, Votava M, Tejkalová R, Horvát R, Heroldová M, et al. Biofilm detection and the clinical significance of Staphylococcus epidermidis isolates. Folia Microbiol (Praha) 2004;49:596-600. Thakkar P, Mehta P, Nataraj G, Surase P. Biofilm forming capacity in staphylococci and comparison between its species. Indian J Basic Appl Med Res 2015;4:313-23. Hassan A, Usman J, Kaleem F, Omair M, Khalid A, Iqbal M, et al. Evaluation of different detection methods of biofilm formation in the clinical isolates. Braz J Infect Dis 2011;15:305-11. Bose S, Khodke M, Basak S, Mallick SK. Detection of biofilm producing staphylococci: Need of the hour. J Clin Diagn Res 2009;3:1915-20. Kawamura H, Nishi J, Imuta N, Tokuda K, Miyanohara H, Hashiguchi T, et al. Quantitative analysis of biofilm formation of methicillin-resistant Staphylococcus aureus (MRSA) strains from patients with orthopedic device-related infections. FEMS Immunol Med Microbiol 2011;63:10-5. Yadav S, Sharma M, Yadav A, Chaudhary U. A study of biofilm production in Staphylococcus aureus. Int J Pharm Med Bio Sci 2014;3:61-3. Ansari MA, Khan HM, Khan AA, Cameotra SS, Alzohairy MA. Anti-biofilm efficacy of silver nanoparticles against MRSA and MRSE isolated from wounds in a tertiary care hospital. Indian J Med Microbiol 2015;33:101-9.